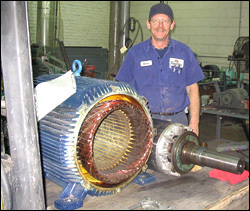 We repair all domestic and foreign electric motors. 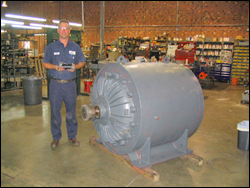 We have complete capabilities to perform total motor rebuilds and our comprehensive In-House machine shop gives us the unique capability to rapidly fabricate new motor shafts, end-bells and all motor components. 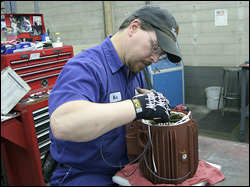 Our 30,000 sq ft repair center has state-of-the-art equipment to fully analyze motor failures and to provide final QC checks. Our Hypot tester enables us to verify insulation integrity up to 6000 volts, our surge testers detect any phase imbalances, and our core loss equipment provides technicians with key data regarding metal fatigue in the stator or rotor. TigerTek's dynamometer enables us to directly couple the motor to provide the ultimate full load test. TigerTek's computerized balancing equipment ensures that the rotor is precisely balanced to eliminate motor vibration and to provide optimum motor performance and bearing life. TigerTek also sells a full line of new motors and drives.